The Four Wings Hotel Bangkok is favourably located on Sukumvit Soi 26, 5 minute’s walk from the Skytrain and Emporium shopping mall, 10 minutes to the Queen Sirikit Convention Centre. Wake in an elegant, carefully designed room and begin the day with the excellent breakfast, which changes every day. The spacious rooms feature attractive bathrooms and stunning Bangkok views. Energize at the fitness centre or by playing a game of squash. Follow it with a refreshing dip in the pool. Savour the sauna and a massage at the Four Wings, Bangkok spa. Or relax with a stroll in the garden. In the evening, enjoy the delicious international cooking at the restaurant, before relaxing at the bar. Then move on to the surrounding nightlife. Start at the night bazaar, which is just down the road from the hotel. Air-conditioned room offers a cable/satellite TV, a fridge and a safety deposit box. A bathtub is included in an en suite bathroom. 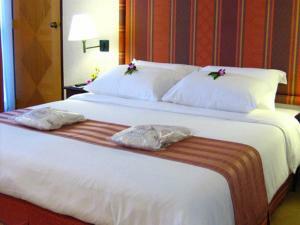 Rate: THB 2040.00 ... THB 3500.00; select dates below to get current rates. Larger air-conditioned room offers a cable/satellite TV, a fridge and a safety deposit box. A bathtub is included in an en suite bathroom. 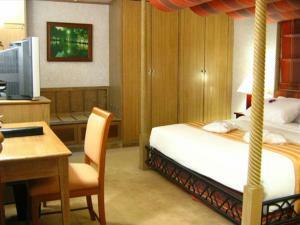 Spacious air-conditioned suite offers a kitchenette, a seating area and a cable/satellite TV.